CLEVELAND, March 23, 2017 - The Lubrizol Corporation announces that in conjunction with its previously announced technology license agreement with Daelim Industrial, it has begun construction of a new polyisobutylene (PIB) unit at its Deer Park, Texas facility. Construction of this unit is consistent with Lubrizol continuing to renew its additive infrastructure as part of the company's previously announced 10-year phased investment plan. The plan is designed to upgrade and enhance Lubrizol's global capabilities. Commenting on the new unit, Dan Sheets, president of Lubrizol Additives, states "With this significant investment, Lubrizol intends to meet future customer demands, as well as be fully prepared for anticipated performance upgrades in lubricants and fuels." 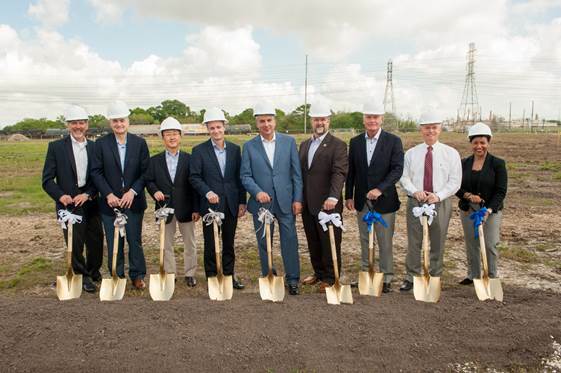 A groundbreaking ceremony was held at the plant on March 22. In attendance was Deer Park Mayor, Jerry Mouton; Deer Park Independent School District Superintendent, Victor White; Daelim Industrial Petrochemical division president and chief executive officer, Jaeyul Kim; Eric Schnur, Lubrizol chairman, president and chief executive officer; Dan Sheets, senior vice president and president of LZA; Tanya Travis, general manager of Lubrizol Texas plants; Mike Vaughn, Lubrizol corporate vice president, operations; and various other members of the Deer Park community and Lubrizol, as well as members of the company's various partnering organizations. Independent School District; and Tanya Travis, general manager of Lubrizol Texas plants.